It’s not a proper holiday party unless I’m wearing a paper crown on my head. The odd joke, a fun gift, and a popping good snap also ring in a good time around my dinner table. 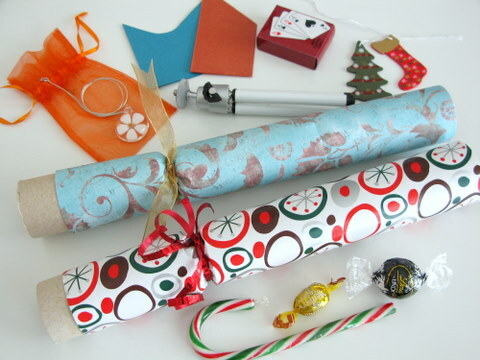 This may sound a little strange to readers not familiar with the history of Christmas crackers, but for those in the know, there’s a lot of frugal fun to be had with these noisy little parcels. 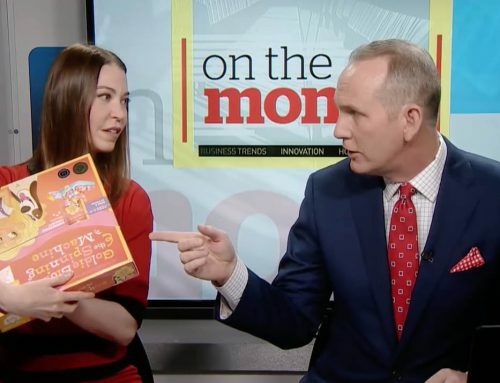 The problem with most holiday crackers sold today is they are stuffed with cheap toys and crappy prizes. A decent set can cost you over $50 for 8 crackers, and the gifts inside are still throw-away trinkets. It’s a snap to make your own crackers, and filling them with personalized messages, thoughtful gifts, and festive paper hats is easy — you probably have many of the materials at home already. Total Cost: I’m a sneaky sneaker, so I reused most of my gear from last year. Cracker snaps cost around $5 (or less) at craft stores for a package of 25 snaps. Small quality gifts can be purchased anywhere (even at dollar stores), and crackers used as presents can cost whatever your heart desires. Stick a diamond ring in there for a ‘pop the question’ proposal cracker, and we’re talking thousands. Or add a homemade ornament to each cracker and the cost is only your time. The trick with homemade crackers is they can be used for a variety of occasions: birthdays, weddings, New Year’s Eve, and even as present toppers or festive table decorations. If Christmas isn’t your thing, then get cracking with other ways to make this fun and frugal project a part of your next party. The size of your paper depends on the length and width of three toilet paper tubes. Classy, I know. Lay three tubes side-by-side and measure. My tubes measure 12″ x 6″ (~30.5cm x 15cm) — enough paper for a little overlap when wrapped. Cut as many cracker sheets as you have guests. 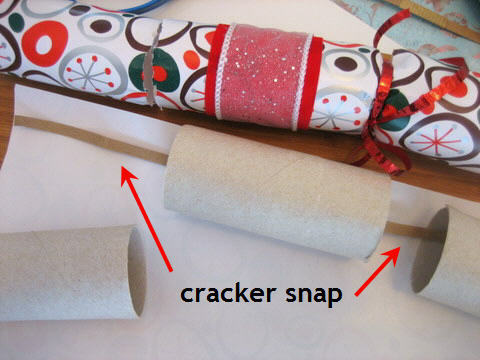 Tip: Be sure to use cracker snaps measuring the same length as your toilet paper tubes. If your snaps are too short, it’s hard for your guests to grab a snapper end and achieve a pop. 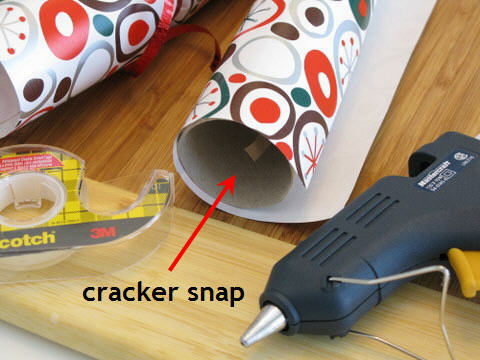 Tape or glue your cracker snap into the central tube. 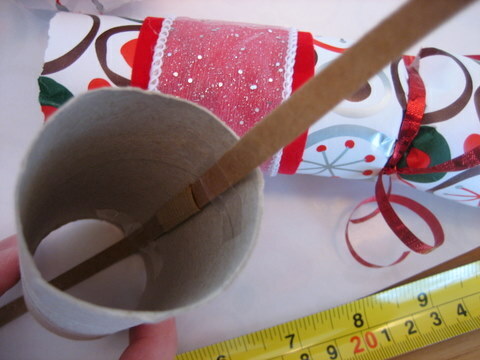 On the wrong side of your cracker paper, place a piece of tape along the outside of your center tube. 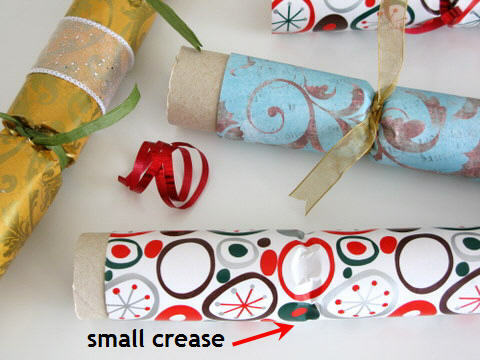 If your paper is thick, you may need to use a crafting glue gun to properly seal your cracker. Press taped/glued edge of tube neatly down along the paper. Align two more tubes on either end of the center tube with the snap neatly placed inside. These extra tubes help you roll a neat and pretty party cracker. 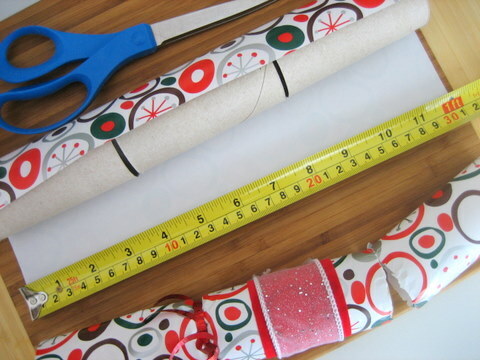 Glue, or stick three pieces of tape along the opposite edge of the wrapping paper. Roll the tubes, and seal it shut to the paper. 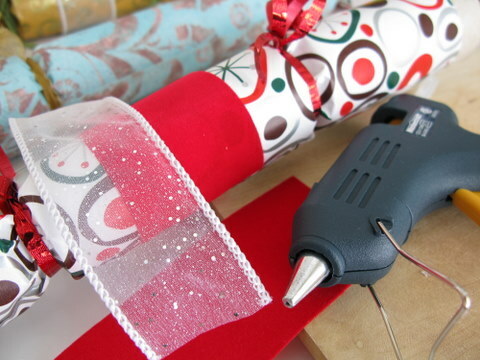 Tip: Do not tape or glue your end tubes to your cracker paper. The outside tubes are used to keep your cracker ends looking perfect, and will be removed later. 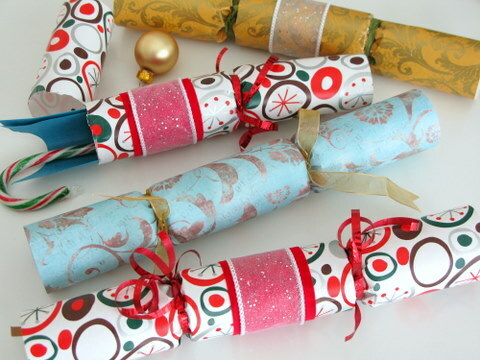 Christmas crackers traditionally contain a colorful paper crown or hat. 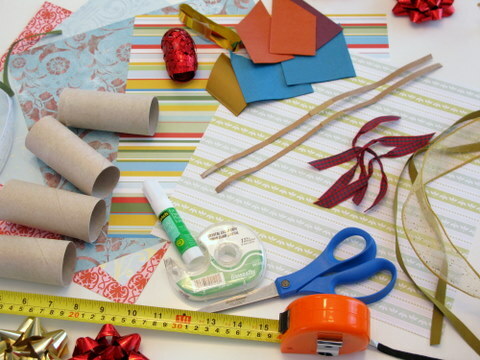 Making a paper hat is simple, you need: tissue paper, a pair of scissors, and some tape. 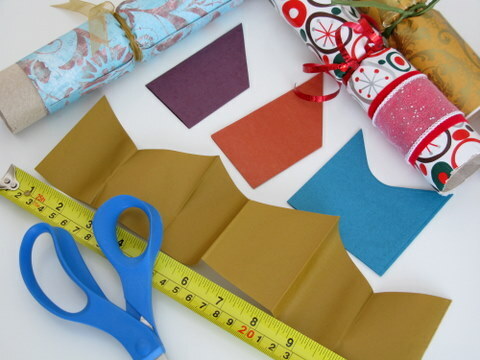 Cut a strip of tissue paper to measure 3 1/2″ x 24″ (9cm x 60cm). Tape short edges together with double-sided tape. Fold in half, create a solid crease. Fold in half a second time, create a solid crease. Fold in half a third time, crease it again. Using scissors, cut one edge at an angle. Open to inspect paper crown. Repeat for each party cracker. We’ll get to the gift ideas in a sec, but first you’ll need to close one end of your cracker to keep the goodies inside. Slide out one end tube to create a small 1/4″ gap between it and the center tube. Use your fingers to make a neat crease in the gap. Wrap a piece of ribbon or string around the gap. Tie a bow or use your preferred decorative flourish to finish the ribbon. Tip: Do not remove the end tube, yet. Keep the tube in place to keep your cracker paper uncreased. Cracker jokes are a big part of the fun. Most jokes are terrible groaners, but they can make for a great dinner icebreaker while giving your guests a good laugh. Find your Christmas cracker jokes here, print or write them out, and then cut them to a small size. 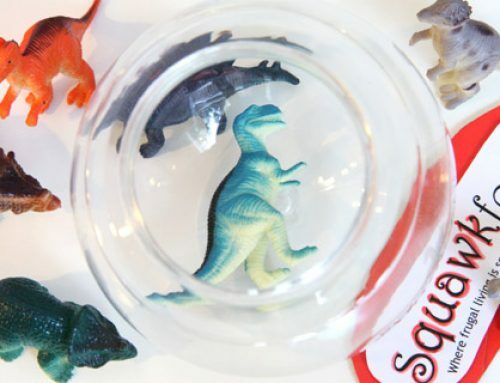 Fold a tiny origami ornament, insert a tiny toy, or add a tasty homemade treat to sweeten the deal. 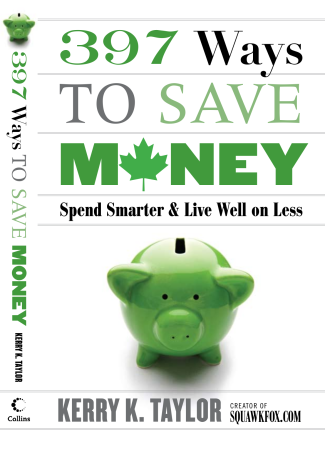 Other frugal gifts ideas include: re-gifting items you won’t use, quality dollar store finds (I found a camera tripod), and homemade crafts, delicious teas, toys, or games. A tiny deck of cards is always fun for kids to play with after dessert is served. Or make the cracker the gift itself by adding a piece of jewelry, a gift card, or a gift certificate from a favorite store. Want to propose this holiday season? 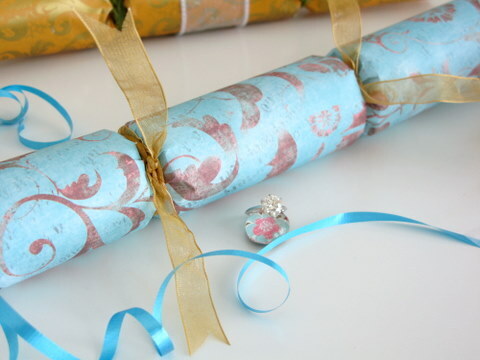 Make a romantic wedding cracker. Fill the open cracker end with a gift, a paper hat (crown), candy, and a joke. Close the final cracker end using the tips from Step Four. 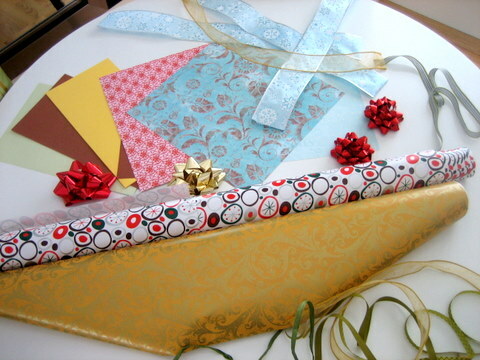 Use crafting stamps, stickers, or a width of gift wrap to add a few finishing touches to your cracker. Carefully remove the cracker end tubes. Be careful not to remove your cracker snap. Put your festive holiday crackers on presents or set them at the dinner table for decoration, and watch the frugal holiday fun unfold. 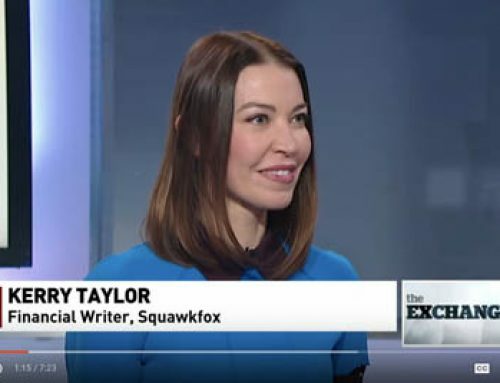 Squawkback: Are party crackers a part of your family tradition? This is fantastic. I knew about crackers in history, but never even considered that it was something I could do today! Dunno if its a silly question, where would i get cracker snaps?A craft shop?They seem really easy!! About where to find cracker snaps… the Michaels store in my large city doesn’t carry them, but I was able to order a bundle of them from a vendor on eBay for a pretty reasonable price (48 snaps for $15 including shipping). 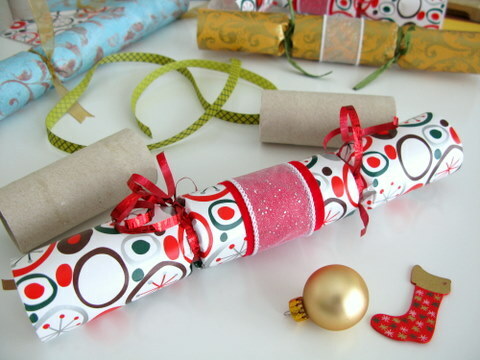 Wonderful DIY Christmas Cracker tutorial. 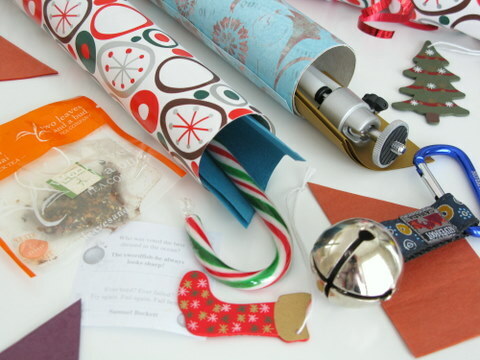 Another idea you can tuck away for next Christmas…if you don’t have the time to decorate and make Christmas Crackers,yet still want to save money,buy crackers already decorated but not filled with novelty items. You can put your own gift items in these crackers and they are cheaper. There’s a small slit in the bottom where you can fill them with cute gift items, like key-rings,wine-rings,jewelry,pins, socks,neckties…but don’t forget to save room the customary joke and party hat. I’ve only seen the snap put outside and then glued to the 2 ends? is that wrong? Do you get a better pop sound if you glue it inside? Also, are you supposed to tie your ends really tight so no candy/small gifts fall out? Or not too tight? I’ve had trouble with paper ripping when making some in the past. Your tutorial was great! Makes me want to try again! Instead of using paper to wrap the toilet rolls, I use standard size napkins in Christmas designs. When you unfold them, they are the perfect size and they are easy to work with. I think rapping paper is just fine, the kids Iove tearing the pieces up! Although I really do love your ideas!!!!! Super cute! You can order to be shipped cracker snaps and I do believe they are quite cheap from Ye Old English Crackers in Bellingham Washington. I am not far from there and picked up 25 for $3.95. Hope this helps some of you. After searching and calling all craft stores in my region – several Michael’s and JoAnne crafts – to no avail (most associates didn’t have a clue what a “Christmas Cracker” was), I found a site of a store in Bellingham, WA. It is Olde English Crackers. They have all the components to make your own, or you can buy them already filled, or wrapped blanks to fill yourself. 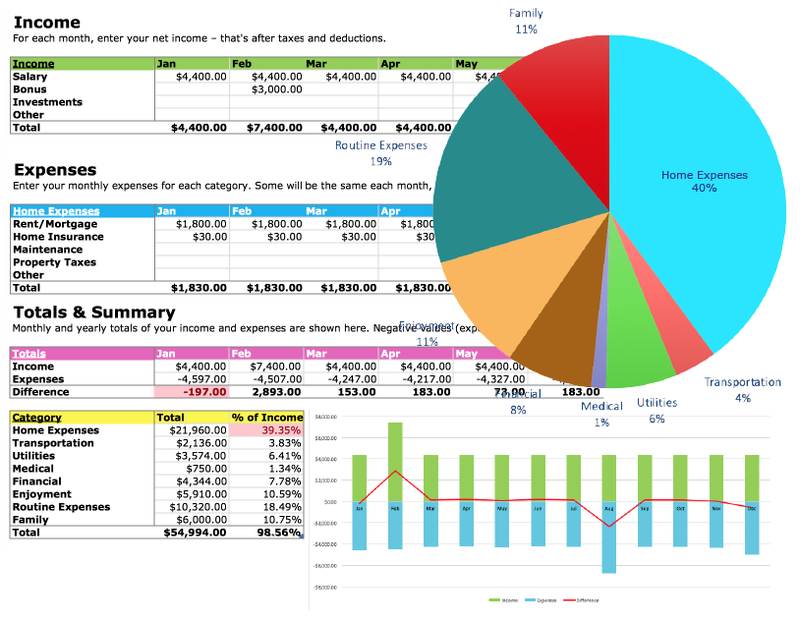 There are all kinds of styles – holiday, general or wedding, and you can also buy in bulk. I was able to purchase the snaps online at $6.25 for 25 snaps. I can’t wait to make them for my upcoming holiday parties. It seems Michael’s tailors their stock to particular markets. The US stores don’t stock the snappers, but the Canadian ones do – probably a result of our British heritage (the cracker is one of the many current Christmas traditions that originated in Victorian England). This year, with an eye to eco-awareness, I decided to make reusable crackers. I bought Christmas placemats at the dollar store (lovely embroidered cut work with Christmas motifs) and used finger-crocheted red yarn for the ties. I did concede to paper hats as a throwaway item only because I couldn’t think what else I could use that would be as compact as tissue paper to fit in that small space. But it’s not a very big concession as I can get 6 hats out of one sheet of paper. And except for the snappers and possibly the jokes (who wants recycled jokes year after year!) and restocking the little gifts, they’ll be reuseable for years to come. As an added bonus, one of the crackers has a surprise (a tiny little “present” tree ornament). Whoever gets it wins the prize (a coffee shop gift card). Should be fun! This is fantastic!! Thank you so much for your great info. My daughter got these for us all this year ( our first time ever to have them) and you were right about the jokes – but so much fun! Also right about the fillers- so I am going to make these and get inventive and personal with the fillers. What fun!! Again many thanks!! Thank you for this! Going to try making them with 24 fourth graders…. Wish me luck!